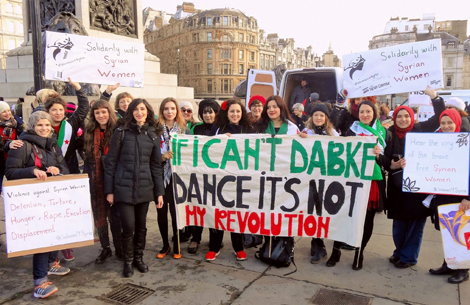 As part of the Million Women Rise march on 5th March, #Women4Syria danced dabke in central London to celebrate Syria’s revolutionary women. 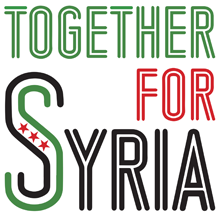 This event is part of the first round of The Syrian Calendar. Follow The Syrian Calendar’s Facebook page for more. It is a great honour to be with wonderful strong women who stand up for their rights. Five years ago, in March 2011, the Syrian people stood up for their rights. Women, men and children took to the streets to demand their legitimate rights and to break the walls of fear. I am confident that speaking to a crowd of strong women, they would understand the glory of the revolution. We must remember that the Syrian people started the revolution, but the Assad regime started the war. And we must never blame the victims. Our rally today is to call for an end to violence against women. violence of massive bombing of homes, schools, hospitals, and markets. And violence of rejection at borders when trying to flee. Every kind of imaginable violence by the criminal Assad regime and its supporters, by ISIS, and by countries closing their boarders to the refugees. We just heard earlier from Kate about the horrifying situation in Calais, and how the French government is trying to demolish the camp inside the jungle. Having a camp in the jungle is already shameful. We must take action. We have to take political action and stand in solidarity with the refugees in the camps. Also, to end the refugee crisis we must end the war in Syria. 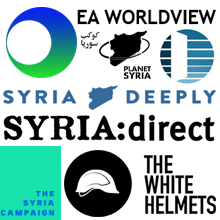 We demand an ethical durable solution to the war in Syria. And then, with justice and reconciliation, Syrians will rebuild the country. We will build a free democratic Syria. Yesterday we saw Syrians inside Syria, with the partial ceasefire. They took back to the streets. Over 104 protests went in the streets of Syria yesterday. It was very inspirational very powerful. I hope you see it. Our group, Dabke Revolution, is going to dance Dabke, which is a folk dance in the many Arab world. And in Palestine it is a form of resistance. We also dance it in weddings. I hope you enjoy the dance. Video of Hala’s speech here.